Are you looking for things to do in Boston? Maybe something that will get you into the holiday spirit? Our staff at Boston’s Boutique Bed and Breakfast are ready to celebrate the holidays with the Boston Youth Symphony Orchestras! On Sunday, December 15 at 3pm, the Boston Youth Symphony Orchestras (BYSO) will be performing a free Family Holiday Concert. 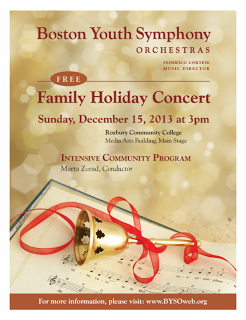 BYSO will be playing holiday favorites that we all know and love at Roxbury Community College . The performance is free and open to the public, but make sure to reserve your tickets . There are many events going on throughout the Boston area during the holiday months, but this show is the perfect opportunity to see Boston’s youth at their finest. Our bed and breakfast is ideally situated for this event, just a short drive to the BYSO and we have a great options for dining nearby as well on restaurant row on Tremont Street in the South End. 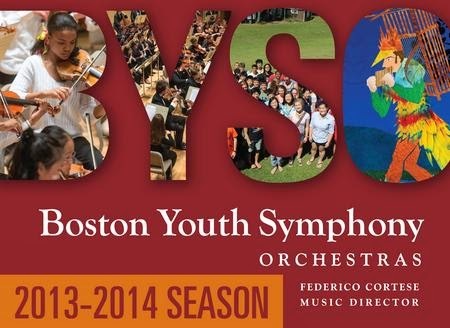 A brief history of the BYSO: Boston Youth Symphony Orchestras started as the Greater Boston Youth Symphony Orchestra (GBYSO) in 1958. Now, over 50 years later, BYSO supports nearly 500 young musicians, ranging from grades K-12, throughout New England. Their mission is to “encourage musical excellence in a professional and supportive environment…” This orchestra, lead by music director Federico Cortese, performs a variety of shows throughout the year, but you do not want to miss out on this Family Holliday Concert. The event is perfect for Boston natives, or for families who are visiting the city and looking to fully immerse themselves into the Boston community.